I’ve covered macvlans in the Bridge vs Macvlan post. If you are new to macvlan concept, go ahead and read it first. To recap: Macvlan allows you to configure sub-interfaces (also termed slave devices) of a parent, physical Ethernet interface (also termed upper device), each with its own unique MAC address, and consequently its own IP address. Applications, VMs and containers can then bind to a specific sub-interface to connect directly to the physical network, using their own MAC and IP address. The switch the host is connected to may have a policy that limits the number of different MAC addresses on a physical port. Although you should really work with your network administrator to change the policy, there are times when this might not be possible (or you just need to set up a quick PoC). Many NICs have a limit on the number of MAC addresses they support in hardware. Exceeding the limit may affect the performance. IEEE 802.11 doesn’t like multiple MAC addresses on a single client. It is likely macvlan sub-interfaces will be blocked by your wireless interface driver, AP or both. There are somehow complex ways around that limitation, but why not stick to a simple solution? Ipvlan is very similar to macvlan, with an important difference. Ipvlan does not assign unique MAC addresses to created sub-interfaces. All sub-interfaces share parent’s interface MAC address, but use distinct IP addresses. Shared MAC address can affect DHCP operations. If your VMs or containers use DHCP to acquire network settings, make sure they use unique ClientID in the DHCP request and ensure your DHCP server assigns IP addresses based on ClientID, not client’s MAC address. Autoconfigured EUI-64 IPv6 addresses are based on MAC address. All VMs or containers sharing the same parent interface will auto-generate the same IPv6 address. Ensure that your VMs or containers use static IPv6 addresses or IPv6 privacy addresses and disable SLAAC. 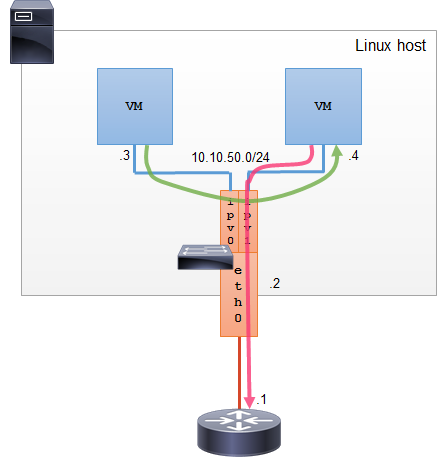 Ipvlan has two modes of operation. Only one of the two modes can be selected on a single parent interface. All sub-interfaces operate in the selected mode. Ipvlan L2 or Layer 2 mode is analogue to the macvlan bridge mode. Parent interface acts as a switch between the sub-interfaces and the parent interface. All VMs or containers connected to the same parent Ipvlan interface and in the same subnet can communicate with each other directly through the parent interface. Traffic destined to other subnets is sent out through the parent interface to default gateway (a physical router). Ipvlan in L2 mode distributes broadcasts/multicasts to all sub-interfaces. Ipvlan L2 mode acts as a bridge or switch between the sub-interfaces and parent interface. As name suggests, Ipvlan L3 or Layer 3 mode acts as a Layer 3 device (router) between the sub-interfaces and parent interface. 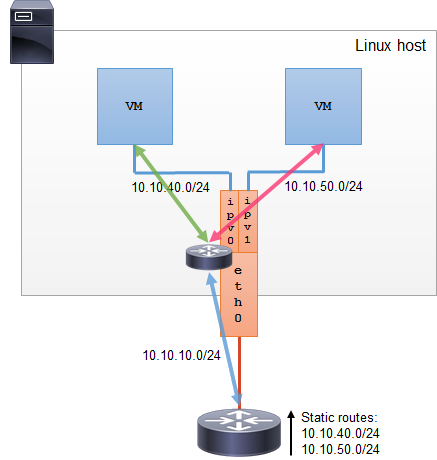 Ipvlan L3 mode routes the packets between all sub-interfaces, thus providing full Layer 3 connectivity. Each sub-interface has to be configured with a different subnet, i.e. you cannot configure 10.10.40.0/24 on both interfaces. Broadcasts are limited to a Layer 2 domain, so they cannot pass from one sub-interface to another. Ipvlan L3 mode does not support multicast. Ipvlan L3 mode does not support routing protocols, so it cannot notify the physical network router of the subnets it connects to. You need to configure static routes on the physical router pointing to the Host’s physical interface for all subnets on the sub-interfaces. Ipvlan L3 mode behaves like a router – it forwards the IP packets between different subnets, however it does not reduce the TTL value of the passing packets. Thus, you will not see the Ipvlan “router” in the path when doing traceroute. Ipvlan L3 can be used in conjunction with VM or Container ran BGP, used as a service advertisement protocol to advertise service availability into the network. This advanced scenario exceeds the purpose of this post. Macvlan and ipvlan cannot be used on the same parent interface at the same time. Your parent interface performance drops because you have exceeded the number of different MAC addresses. For production, you should consider swapping your NIC for a better one and use macvlans. Physical switch limits the number of MAC addresses allowed on a port (Port Security). For production, you should solve this policy issue with your network administrator and use macvlans. You run an advanced network scenario, such as advertising the service you run in the VM or container with the BGP daemon running in the same VM or container. This actually means we can’t ever have two or more VMs in the same network when we use IPVLAN L3 ? What if we need a mixed environment? Like 3 VMs in Subnet A, 1 VM in Subnet B and 1 in C for example ? Is there a way to do this? When you use ipvlan L3 mode, you can have multiple VMs in the same subnet. 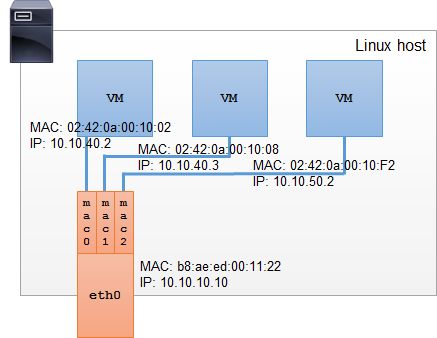 You can also have a mixed environment as you have described it on a single ipvlan parent interface. The only caveat is that broadcast and multicast traffic between the VMs, even if they are in the same subnet, is blocked. Each sub-interface has to be configured with a different subnet, i.e. you cannot configure 10.10.40.0/24 on both interfaces. When you use ipvlan L3 mode, you can have multiple VMs in the same subnet. For me they are mutually exclusive. Aren’t they? No. If you want to have multiple VMs in the same subnet, you should connect them to the same ipvlan L3 subinterface. You cannot configure the same subnet on multiple ipvlan L3 interfaces, but you can have multiple VMs connected to the same ipvlan L3 interface. I have a nuc as KVM host and I have several KVM vms runing. I want to use docker inside one of KVM’s guest. So the only option is use IPVLAN L2? Not necessarily. You can create a KVM public bridge and connect your KVM guest to the bridge. Then you are free to configure MACVLAN, IPVLAN L2 or IPVLAN L3 on KVM guest interface that is connected to KVM public bridge, with all the bonuses and restrictions described in the post. I hadn’t thought of using containers but that’s a great idea. Thanks so much for sharing! Copyright © 2019 HiCube. All Rights Reserved. The Ward Theme by bavotasan.com.